Childhood may never be quite the same again - the maker of Smarties has announced it is to ditch the colourful chocolates' tube-shaped packet. Nestle Rowntree is to replace the beloved 68-year-old cylindrical design with a hexagonal or six-sided pack. The removable plastic lid on the current design will also go in favour of a cardboard flip-top. Nestle Rowntree said the revamp was needed to ensure the brand remained "fresh and interesting" to youngsters. Smarties have been sold in a cylinder-shaped packet since the sweets were first launched by Rowntree's of York in 1937. 570,000 tubes made each day. They were originally called Chocolate Beans but were renamed a year later. Since then empty tubes have been used by creative children to make everything from space rockets to castles, while the removable plastic lids were collected for the letters of the alphabet that were imprinted underneath. The new so-called Hexatube packet will go into stores during the summer. "We don't change something this famous just because we feel like it," said Neil Ducray, director of marketing at Nestle Rowntree. "We have done research that shows kids today have so many different influences that we need to keep the brand and the packaging fresh and interesting for them. "We decided on the Hexatube shape because it has a tactile feel with lots of edges. "Mothers also like the new end because it doesn't come off easily and spill the Smarties on the floor." Swiss-based Nestle, which bought Rowntree back in 1988, denied suggestions that the redesign was to save costs. It reassured fans that the new pack would still contain the same number of Smarties - about 48 per tube - and will continue to sell for approximately 33p. The sugar-coated chocolate sweets will also retain the same eight colours - red, orange, yellow, green, mauve, pink, brown and blue. If all the Smarties eaten in one year were laid end to end it would equal almost 63,380 miles, more than two-and-a-half times around the Earth's equator. Do you have fond memories of the Smarties tube? This is a disgrace! I suggest we organise an immediate boycott of all Nestle products. The best thing about the old Smartie tube was that when you were finished with the sweets you could "karate-chop" it to fire the lid across the room at some speed. This usually resulted in me being told that it was "all fun and games until somebody loses an eye". Ah, those happy days before the dreaded Health and Safety spoiled everybody's fun! Funnily enough, I remember Smarties coming in a small cardboard box - just like the new design when I was growing up in Ireland. I always remembered the stains of chocolate on the tops of the box from happily tucking in! So from my perspective - it's a return to happier days! I've always loved to pop the plastic lid and see how far it goes! They always have to ruin somebody's fun. Shame on them!!! This is a disaster. Traditional Smartie tubes are a wonderful charity fund-raising aid. We have used the Smartie-tube challenge to raise thousands of pounds in our local community. You give people a free tube of Smarties, which are theirs to eat, but ask them to return the tubes full of 20p pieces. This is an effective and easy way of raising money for charity. Shame on you Nestle Rowntree for removing this opportunity. Why the need to change!!! 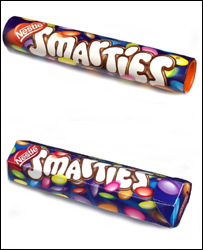 If the design has lasted so long already why would a new design change the fact that kids want Smarties. I can fondly remember collecting the lids and making telescopes from the tubes. Another change for change sake. Would the marketers please leave things that don't need improving alone!!! The best bit about the old tube with the plastic end was always when the tube was empty. You eat the Smarties with relish (the orange ones last of course! ), then put the top back on the tube, rest it on a surface, and bang the edge of your hand down hard about half way along the tube, to see how far you can fire the plastic top. 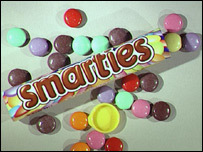 That really was always one of the best bits of Smarties, and in fact in my thirties I still do it! The children of the future will miss out on a great entertaining activity. The packaging is the most important part - its a British tradition!! This is utter blasphemy! The Smarties tube is a classic, and has been an integral part of my - and no doubt many other people's - childhood. Nestle are making a huge mistake. Is it cynical to suggest the top has gone to avoid legal action following choking incidents, and the tube is no longer cylindrical to again avoid tripping/falling accidents when tubes roll across the supermarket floor? No, didn't think so either. It's disgraceful. It's about time that the government introduced some form of protection for things like this, like we have for listed buildings. Smarties tubes are a small but lovable part of our culture and they need to be protected! I always used to guess which letter would be in the lid. I also used to unravel the ends of the tube and pull out the card board disk that formed the one end of the tube. Other sweets came in cheap and nasty boxes not unlike the ones Smarties now plan to use. The Smarties tube is a powerful piece of packaging and whoever came up with the idea of ditching it should be 'moved sideways'. I learnt to read using the Smarties lid tops! This is an outrage. Is Nestle mad?!!! Getting rid of the Smarties tube would be like changing the Union Flag or flag of Switzerland. It is part of our culture. Once again the marketers have decided that "they" are the Smarties, and have at once underestimated the brand loyalty. To say that the brand needs freshening when it's lasted nigh on 70 years just shows a marketing department whose only measure of progress is how many things they fiddle with. If it ain't broke, don't fix it! Strange how a six sided shape packs more easily on a pallet than a tube will. Perhaps transport efficiency played a bigger consideration than anything to do with a child tactile requirement. We won't be able to collect all the letters printed on the ends of the tubes any more! I only need Q to complete the set!! How dare they remove the world's greatest artillery machinery - the flying Smarties lid propelled by air pressure resulting from a sudden squishing of the tube! I'm shocked and appalled! Is nothing sacred! I think it's great! A hexagonal tube has a lot more scope for creative play and is mathematically more interesting. As long as they take out the blue ones then it's happy days! No change to the taste and shape of the actual Smarties? That's OK then because as all children should be taught - its what's on the inside that counts. Please, please keep the alphabet letters. Print them on the inside of the hexagonal lid if possible. It's a feature that makes Smarties unique and shouldn't be taken away ! I remember as a small child using the plastic lids as a spelling and vocabulary aid. My parents would let me have the Smarties if I could solve a puzzle that related to the letter on the lid. Who said kids are easily bought? Why?! Why?! Why have they done this? Only Smarties have the answer! Quite simply the worst catastrophe to befall modern man. Don't do it, Smarties!! If you hold smarties in you hand for too long, they sweat and the colour bleeds. I cannot comment on the demise of the tube as this is way too upsetting to even think about let alone speak of right now. Its a tube of sweets, get over it.... Nestle are free to do what they choose and if the change in shape doesn't work, well give it a few months and they release a massive marketing campaign of "Smarties are Back" in their original tube size and shape. Smarties in a box? Yet a further erosion of our national identity. What next, white Marmite? Is nothing sacred? I cannot believe we are going to lose the sound of the Smarties slithering down the tube. With everything that's going on in this world at the moment this is just another sickening blow to worldwide moral. I've rarely been more angry about anything in my life. What does it matter? You folks want to get yourselves a real problem. This is clearly the end of civilization as we know it. I've spent the last 32 years building a two storey house for my family entirely out of Smarties tubes, using the lids as flooring, paving stones and a driveway. I estimated to be finished by 2008, but if the hexagons come in, I'm going to have to redo the whole roof. The darkest moment in our nation's history.